The open-source developer group behind the dollar-pegged, ethereum-backed stablecoin DAI is considering whether higher fees could help stave off mounting liquidity issues. During the weekly developer call on Feb. 28, some token holders, including MakerDAO founder Rune Christensen, voiced concerns about whether the peg, the mechanism by which the cryptocurrency holds a stable value, can continue under the present design constraints. Christensen said last Thursday that the DAI’s dollar-peg is “almost at a breaking point” as a lack of organic demand threatens to start a “dangerous feedback loop” driven by “a speculative drop in the price.” He then called for a community poll to guide stakeholder votes about increasing fees and raising the stablecoin system’s debt ceiling. Launched Monday, people who hold MKR governance tokens are now able to vote on whether to raise the “Dai Stability Fee” from 1.5 percent to 3.5 percent. According to CoinMarketCap, the stablecoin has fluctuated between $0.98 and $1.02 across global markets so far in 2019. On Coinbase Pro and Bitfinex in particular, the range has consistently hovered around $0.98 since January. “We were giving out a good deal but unfortunately, we’ve got to lock that back a little bit until we find the right level of stability fees,” MakerDAO risk management lead Cyrus Younessi said Tuesday during a public call. The impact of these fee increases could have far-reaching effects on several applications already leveraging the popular stablecoin for in-house operations. For example, Gitcoin bounties are frequently denominated and paid out in DAI coins, and entire payment channel platforms – such as the Connext Network that will soon see a mainnet launch on ethereum – leverage DAI as their primary transaction medium. At present, there are currently over 2 million ether tokens locked in MakerDAO smart contracts, accounting for roughly 2 percent of the total ether supply. 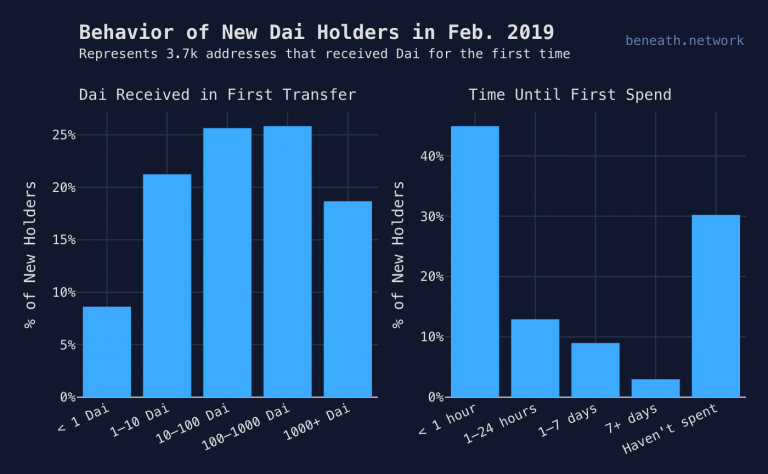 Still, most DAI adoption at the moment is taking the form of a “collateralized debt position,” meaning the user locks three times the amount of ether in a smart contract that they want to withdraw in the dollar-pegged DAI. Then, DAI holders generally liquidate the DAI on external exchanges to pay fiat bills. The growing popularity of such loans could be a contributing factor to the destabilization of the broader network. 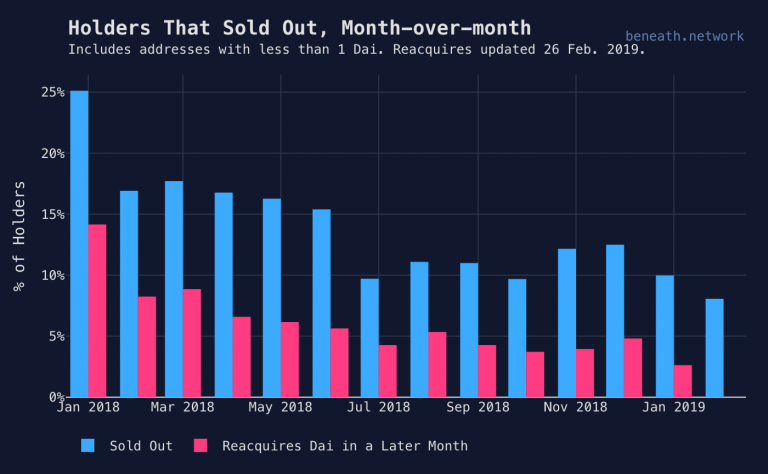 In short, it appears organic demand for DAI itself isn’t growing as quickly as demand for loans that have essentially become a fiat off-ramp. Based on MakerDAO’s data, the gap between DAI holders who sold out their positions and those that return to purchase DAI later that same month (presumably to pay off loans), is widening in 2019. To be fair, MakerDAO contributors and employees are working to increase demand for the stablecoin beyond the ethereum ecosystem. Nadia Alvarez, MakerDAO’s business development associate for Latin America, told CoinDesk that crypto-financial service companies now use DAI for backend value transfers. For example, the bitcoin exchange BuenBit and the fiat currency exchange BuenGiro both use DAI for value transfers behind the scenes. Meanwhile, according to MakerDAO’s own statistics, the majority of new DAI holders spend the stablecoin loot within the first hour of acquiring it, presumably to liquidate the asset. Plus, the ether collateral in any DAI CDP is automatically liquidated if the ETH price drops below 150 percent, compared to the original 300 percent collateralized. Users are not guaranteed they will get all of their collateral back. Therein lies the contradiction of DAI CDPs. So far, it’s unclear who is in charge of feeding the price-tracking data into the smart contract. There are several players in this ecosystem, including the DAI-centric project MakerDAO and the nonprofit MKR Foundation, with a secondary MKR token that grants holders the ability to vote on DAI governance issues. A MakerDAO spokesperson said the year-old CDP smart contract was written by “Maker developers,” including the project’s “head of Oracles,” Mariano Conti, and has also been used by companies such as Compound Finance and Gnosis. Without specifying any person or company by name, “for security reasons,” the spokesperson explained that a “decentralized network of Maker employees, community members and people from other projects” queries roughly 14 sources, aggregates their price data and calculates the overall median price of ether. The spokesperson added that people who hold MKR tokens are the only ones with the power to vote to add or remove data sources. This becomes a crucial focal point as DAI holders grapple with conflicting opinions on whether to increase the DAI treasury’s debt ceiling. Talk of “liquidating the [ether] collateral” if the broader market drops is a real prospect discussed during public governance meetings, although during the Feb. 28 call Christensen emphasized this consideration is only hypothetical at the moment and the team aims to prevent that type of worst-case scenario. And, according to a study by the venture capital firm Placeholder, less than 10 percent of MKR token holders participated in the previous vote to raise stability fees to 2 percent. In order for this stablecoin to survive, it will require a diverse ecosystem of stakeholders. For now, DAI governance is managed by investors who hold the foundation’s MKR tokens, of which 6 percent is owned by Andreessen Horowitz’s a16z fund. According to Etherscan, the top three MKR holders own a combined 55 percent of the tokens, with the top holder alone controlling 27 percent. A spokesperson for crypto hedge fund Polychain Capital confirmed it owns a “significant portion” of MKR tokens. As for the rest of the top 10 holders, their names are not publicly listed. Spokespeople for both ethereum co-founder Joseph Lubin, who owns the ConsenSys conglomerate that incubates MetaMask and GitCoin, and the Ethereum Foundation declined to comment on whether they own significant portions of MKR. Regardless of whether ConsenSys owns MKR, it is undoubtedly a key player pushing for broader retail adoption. Austin Griffith, director of research at Gitcoin, developed the xDai burner wallet to help users join the system without generating private keys. According to Griffith, simplifying access to that first transaction and denominating value in dollars could make crypto more approachable for people who aren’t already familiar with tokens. The Maker Foundation, run by MKR token holders, funds the MakerDAO project, which is responsible for maintaining the price-monitoring system that’s referred to as an Oracle. According to MakerDAO COO Steven Becker, by 2020, DAI users will be able to take dollar-pegged loans leveraging diverse tokens, such as those formerly used by ethereum projects in token sales and invested in heavily by companies like Polychain Capital. In the meantime, Stephen Palley, a partner at the Washington, D.C.-based law firm Anderson Kill, told CoinDesk the lack of transparency around the DAI ecosystem and its Oracle could leave room for liability. The plan for the revamped Oracle system has DAI users like Richard Burton, CEO of crypto wallet company Balance, feeling bullish. Burton took out a CDP to pay salaries at his startup. Likewise, former SpankChain employee Chelsea Palmer, who was laid off when ether prices tanked, tweeted that she plans to put her remaining ether into DAI CDPs to pay her fiat bills.